I use my backyard as a summer kitchen and cook everything out there to keep my house cooler. I like to cook my softshells out on my grill, either in a black spider or my larger 14 inch stainless steel saute pan depending on how many I have. If you have read the recipe for perfect softshells, you can easily ramp up the remaining pan juices into a wonderful sauce for linguine. Prep extra garlic and parsley chopped with sea salt. After removing crabs from the pan, add extra olive oil, about a half cup for a pound of pasta and a bit of butter if you like. You can also take a couple of more minutes here to throw in some scallops or shrimp to add to the pasta. Toss in the persillade, maybe some jarred sun-dried tomatoes and their oil, shaved fennel, and/or roasted red peppers, anything, in short, you like. Once all your additions are jumping, add a good cup of a pouilly fume or fume blanc to deglaze. Toss in some al dente linguine and cook down for a minute or so until the pasta starch thickens the sauce nicely. Mound on platter and top with the crispy softshells. Sprinkle additional chopped parsley and pepper on top and serve hot. Went to Mud City, Tom’s River Asked to have my softshells sauteed crisp. Was told that couldn’t be done! No wonder there were only four patrons there on a balmy Thursday evening at 7:30! We overheard them saying the better cook was not on that night. Guess the locals know when to go. 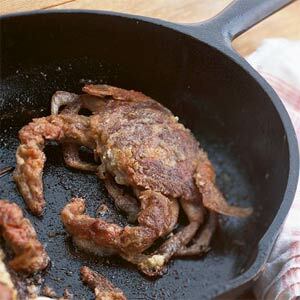 Foolproof Method of Sauteeing Crispy Softshells: Clean and dry crabs, dip in clarified butter, then in seasoned flour, shake off. Smash quantity (depends on how many crabs you are working with) of garlic & parsley. Saute crabs in clarified butter and olive oil abt 2 mins on each side. Toss in garlic and parsley. Remove crabs. 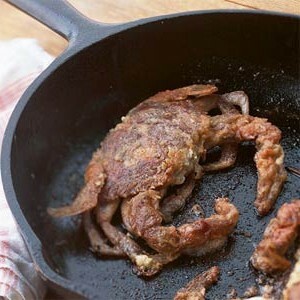 Place sauce ON PLATE with crispy crabs on top so sauce DOES NOT decrisp them!